Please join the Friends of Lakeview* on Wednesday, February 27th from 6:30-8:30PM for a fundraising event at Bitter Pops to support the Lakeview Low-Line. Frasca Pizzeria and Wine Bar is generously providing food for the event. This promises to be an entertaining night celebrating the Low-Line and getting to know fellow Low-Line supporters over pizza and beer! 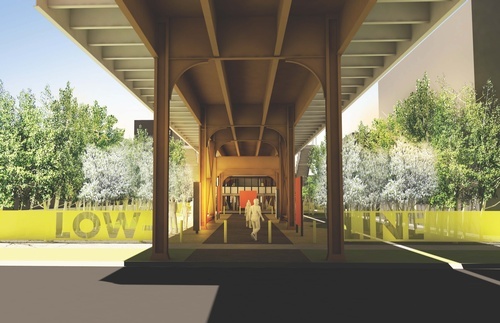 As many of you know, the Low-Line re-envisions the half-mile space beneath the CTA "L" tracks between Southport and Lincoln avenues as an exciting Chicago art destination and a fun and dynamic path connecting Lakeview. As a unique attraction, the Lakeview Low-Line will not only beautify and green the neighborhood, but also has the potential to become a landmark attracting attention to Lakeview and Chicago while encouraging both visitors and residents to explore Lakeview's local business districts. Phase 2 will complete one-third of the entire Lakeview Low-Line project by connecting Ashland and Lincoln avenues with a new pathway and art walk. To date, we have raised over $53,000 for Phase 2 of the Low-Line. We need your support to make Phase 2 of the Low-Line a reality! Learn more about the Lakeview Low-Line Project here! *This event is hosted by Friends of Lakeview, the 501(c)(3) non-profit partner organization of the Lakeview Chamber of Commerce. In partnership, Deschutes Brewery and Bitter Pops has offered to donate 100% of the proceeds from the sale of Da Shootz American Pilsner and $3 from each pint sold of Deschutes Brewery’s Fresh Haze IPA. Register & Donate Today for a Chance to Enter our Raffle! For every $50 you donate, you will receive 5 raffle tickets for a chance to win a Lakeview Gift Basket worth hundreds of dollars! Raffle tickets will be available for purchase at the Bitter Pops event for $20 each, so donate today and save!